This Castle District hotel features stunning views of the historic city and River Danube. The hotel is just minutes away from the city center and Fisherman's Bastion. Guests can indulge at the ICON restaurant, featuring Mediterranean and authentic Hungarian cuisine. Guest rooms are comfortable and spacious, with some offering city and river views. 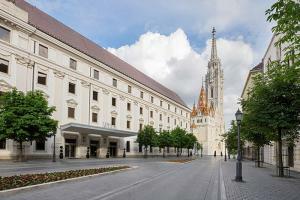 The hotel is just a short walk from the Buda Castle, Budapest Historical Museum and the Hungarian National Gallery. Set in the heart of the Royal Castle District, just steps from Matthias Church and Fisherman's Bastion.